The APS-9000 Series are dual output, 300 to 1000VA, linear AC power source. To protect the APS-Series and loads from unexpected conditions, over current, over temperature, and short-circuit protection are standard. High accuracy and low distortion are maintained at true RMS and < 0.5% THD, respectively. The key lock feature prevents tampering. Three separate LED displays simultaneously show frequency / voltage and current to enable easy operation. Configuration is simplified with the store/recall function for output settings. Software calibration reduces maintenance efforts. 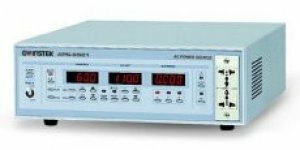 The APS-Series are suitable for middle-size laboratories and production test applications requiring high accuracy and security.